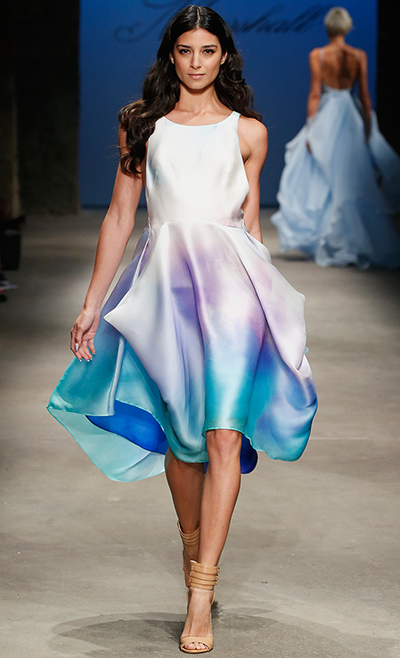 Leanne Marshall, the Season 5 winner of the hit television series 'Project Runway,' showed her famous wave-inspired pieces for her upcoming spring 2016 collection. Marshall's designs are "known for their light, flowing lines, feminine details and timeless elegance," and the designer's goal is to create dresses that showcase rather than overshadow a woman's true beauty. In true Leanne Marshall form, the spring designs embodied the ultimate ethereal look, using lots of sheer, flowy fabric and colors like black, blue, ivory and green. The runway show kicked off with the dark and mysterious, and slowly morphed into a more whimsical, one-with-nature aesthetic. Models wore their hair in long, messy tresses and the only hairpiece in sight was a branch or two at the crown of their heads, giving the show a theatrical, almost Shakespearian feel -- a more fashion-forward 'Midsummer Night's Dream,' if you will. Once again, Leanne Marshall captured the essence of designs meant to complement the women wearing them, while empowering wearers to feel feminine and angelic, yet strong. Her spring collection represents total sophistication with a hint of playfulness, and we can't wait to get our hands on it.